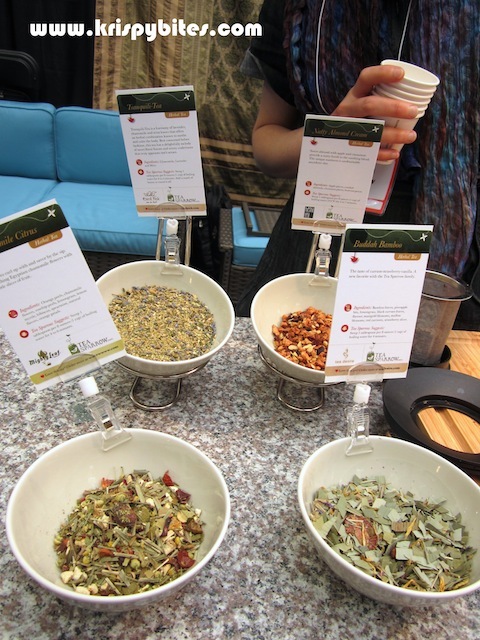 Vancouver guest blogger Py takes us to EAT! Vancouver 2013. EAT! Vancouver is a festival of all things food: whether your fascination is with the making, eating or watching (aka drooling over celebrity chefs) of food, there is something for you. It is that huge. Children 12 and under enter the festival for free; youths (defined as those aged 13-16) are charged an admission fee of $9; adults pay $14 online or $16 at the gate and seniors pay $14. Included in the price of admission is a nice, reusable bag and a small assortment of vendor samples. That, however, is just the beginning. There are two main ways to navigate EAT! Vancouver. 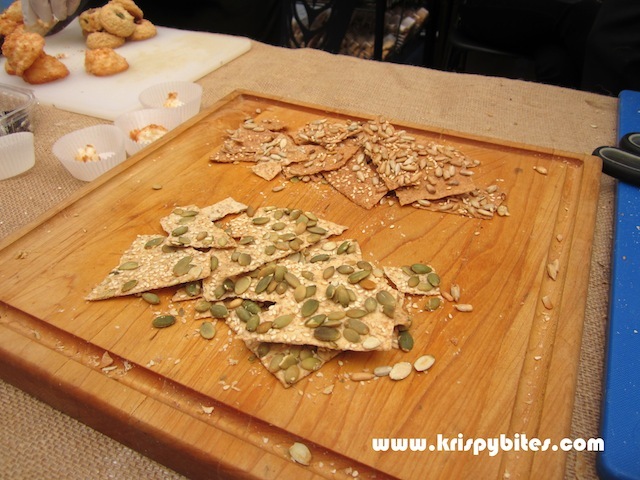 You can choose to focus on the exhibitors and the food samples they have – of which there are many – or you can scout out the guide beforehand and plan your rounds. The former is recommended for those new to EAT! Vancouver and it was what I did the first time I visited the expo several years ago. The latter, however, is for those who know what they like, want or are after, and have the discipline to resist the temptation to wander. There are four main parts to EAT! 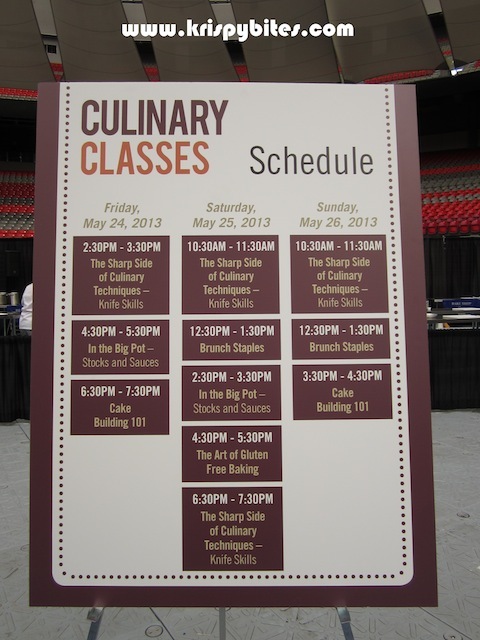 Vancouver: the exhibitors, the seminars, the chef/cooking talks/demonstrations and the culinary classes. 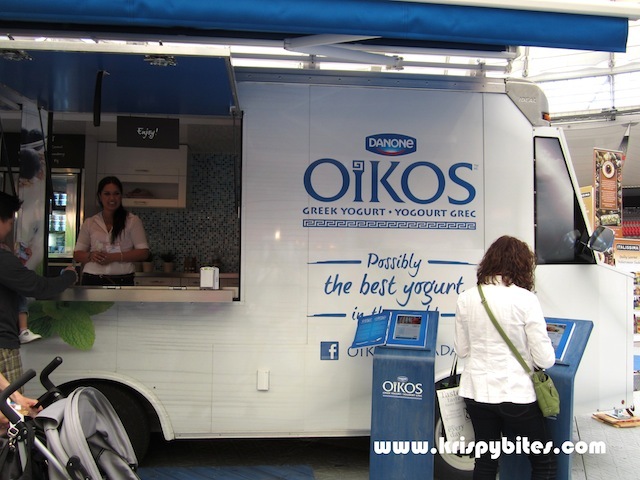 The exhibitions make up the bulk of the expo in terms of space, and it is where any comer to EAT! Vancouver should spend the majority of their time. 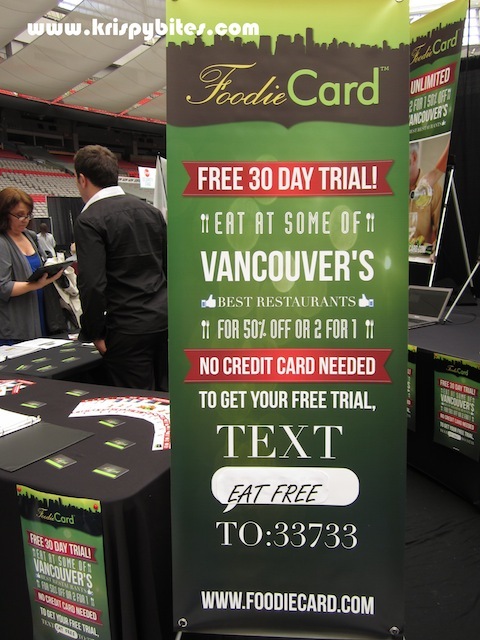 The variety of exhibitions with samples range from the known, tried and true (Urban Fare, Danone’s Oikos Greek Yogurt, Green & Black’s) to the gems of Vancouver (La Chocolaterie from Izumi-Ya in Richmond, Canadian Maple Delights located in Gastown) to products you might one day see on the Canadian venture capitalist show Dragon’s Den (Trugs Gourmet, Better Beans). 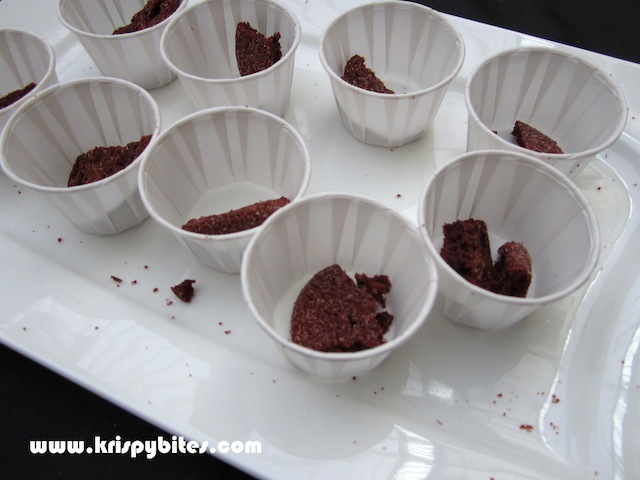 One of the more delicious snacks I tried was the Red Velvet Bites from Trugs Gourmet. The cookies were crunchy, light but satisfying, with just the right amount of sweetness. 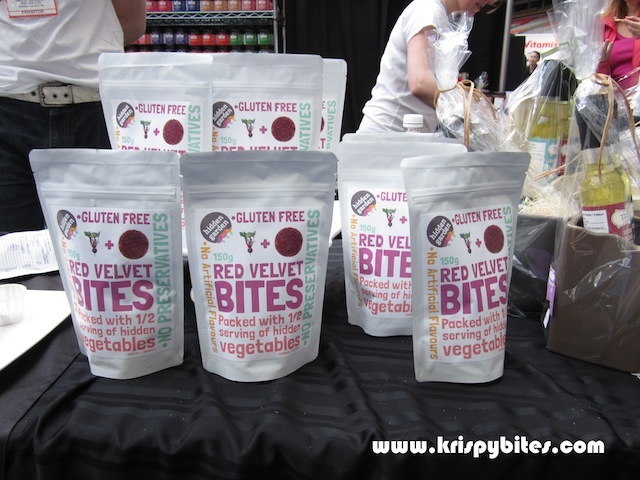 They’re also gluten-free, made with vegetables and other ingredients you will recognize and can pronounce, and derive their red color from powdered beets instead of dyes synthesized in a test tube, extracted from petroleum, seeds or insects. 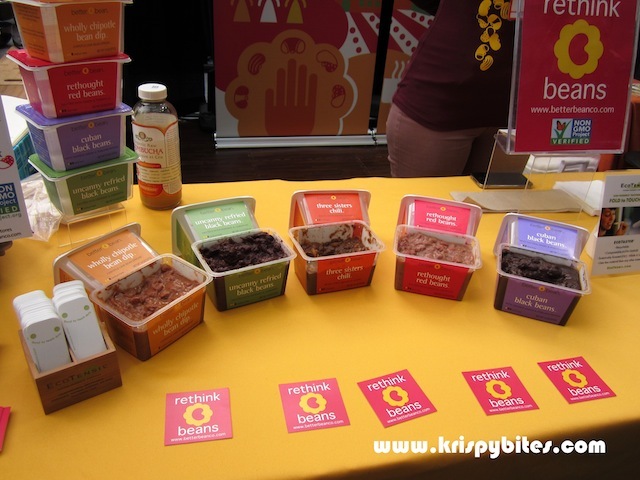 On the topic of gluten-free and vegan, Better Beans also gets a mention for their assortment of bean sides and dips re-imagined. 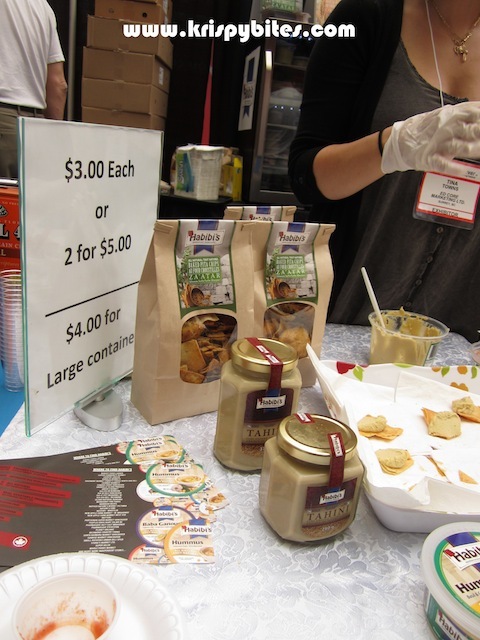 One of their best sellers and the spiciest of their products, Wholly Chipotle Bean Dip, was my favorite of the offerings available. Rich, with the grainy texture of beans, thick and satisfying, this dip is mildly spicy and would pair wonderfully well with a thin bread. There were a number of salsa and hummus vendors (including an offering from Vancouver’s very own Las Magaritas on 4th Avenue), but there was nothing outstanding about any of them. 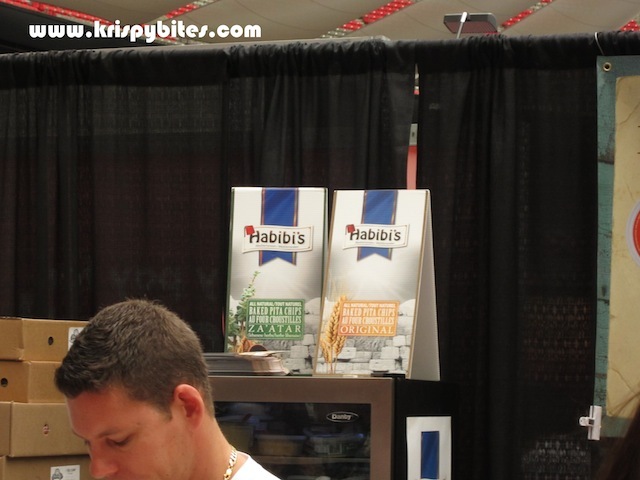 I was, however, impressed with the baked pita chips the hummus samples were served on. They were savory, but not salty, solid, but not thick, and snapped apart with a satisfying crunch. I could’ve munched on those for hours. 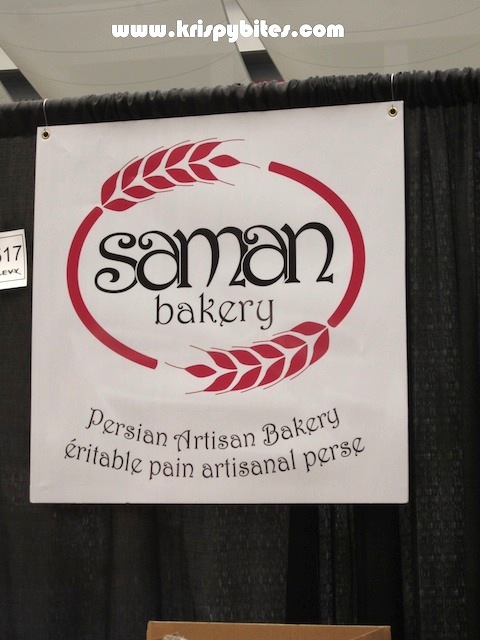 Something else that was really good were the seed-studded crisp samples from Saman Bakery, a “Persian Artisan Bakery” company. I didn’t get a chance to look at the prices, but if they’re not expensive, go grab a box to snack on! 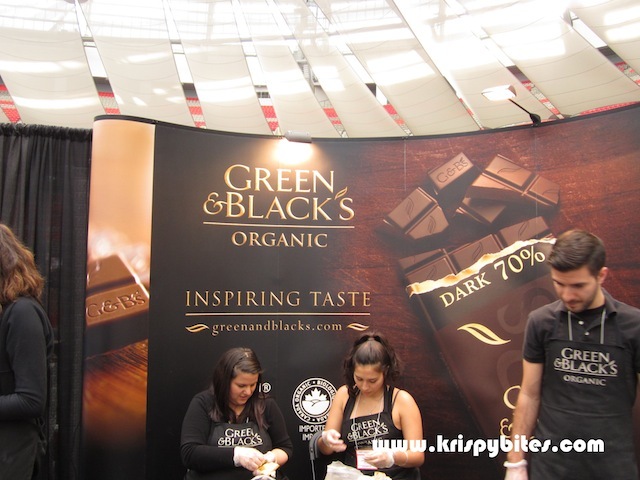 Speaking of snacks, Green & Black’s also had a stand with a large offering of chocolate samples. 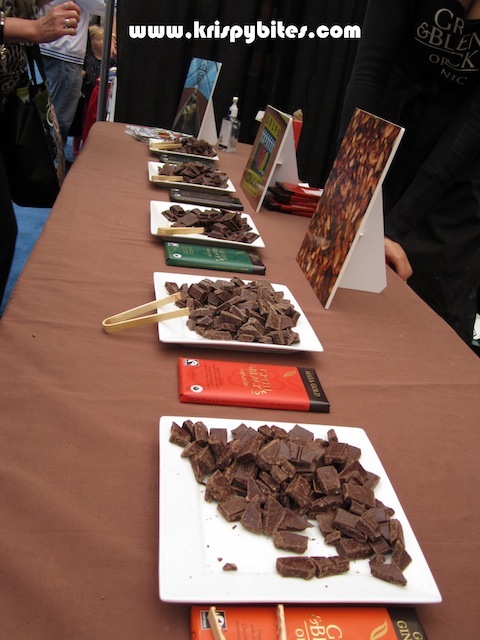 I tried their 85% chocolate, their orange spice chocolate and their milk chocolate, and all were good. Most 85% chocolates give you a gummy taste in your mouth simply because they don’t melt, and while Green & Black’s 85% chocolate had a bit of that gumminess and a background bitterness, it was palatable. The orange spice chocolate was delicious, but then that’s a tried and true pairing. The quality of the ingredients, evident in the clarity and sharpness of taste, were what shone through for me here. I was hesitant to try the milk chocolate because I thought it would be either too sweet or too plasticky. I was very pleasantly surprised to find that it was neither. Unlike most milk chocolates, it slowly melted in my mouth without a plasticky texture, but it wasn’t sickeningly sweet, either. 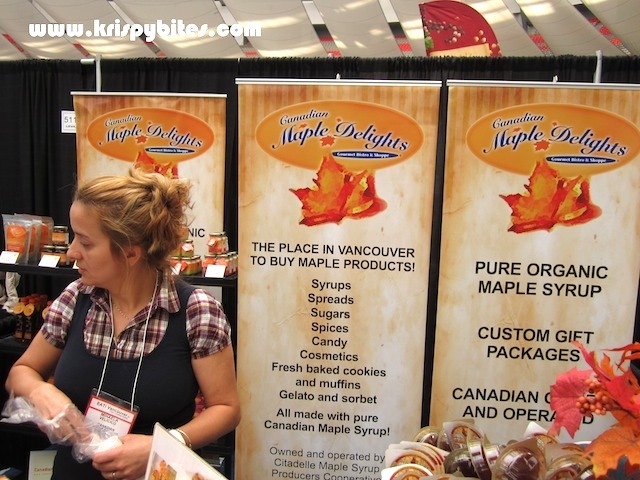 I also tried the maple syrup and maple butter from Canadian Maple Delights, which has a location in Gastown. I’ve passed by it several times before and always thought it was a tourist trap, so I was curious to taste their products. The maple syrup was ridiculously sweet, and should definitely be taken in tiny doses, but the strong, rich flavor of maple makes this a viable decision. The maple butter was also delicious. I am sold. The next time I come bearing gifts to non-Canadian friends, I am visiting Canadian Maple Delights. 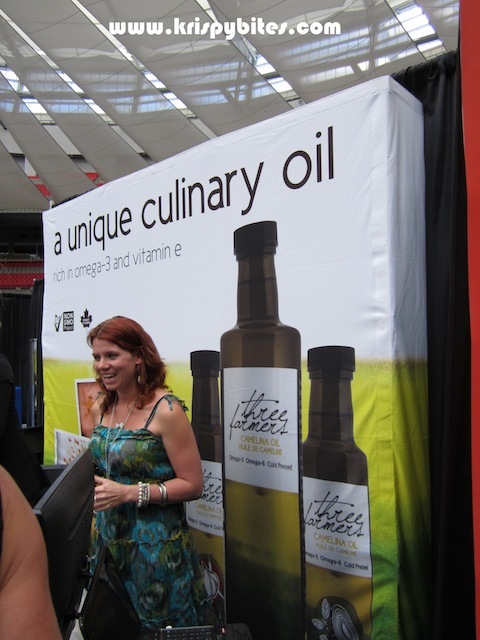 The last food exhibit I am going to mention is Three Farmers camelina oil. In addition to being a Canadian prairie product, it was a delicious oil. I like my olive oil, extra virgin and regular, but sometimes, I just don’t want that olive flavor because it doesn’t pair well with the food, or because I can’t cook with it at high temperatures (olive oil has a very low smoke point – I learned this the hard way when I set off my fire alarm making kale chips at 400F). Canola oil is a cheap, fishy smelling alternative, and I’ve just never been that fond of the flavor or texture of peanut oil and grapeseed oil. 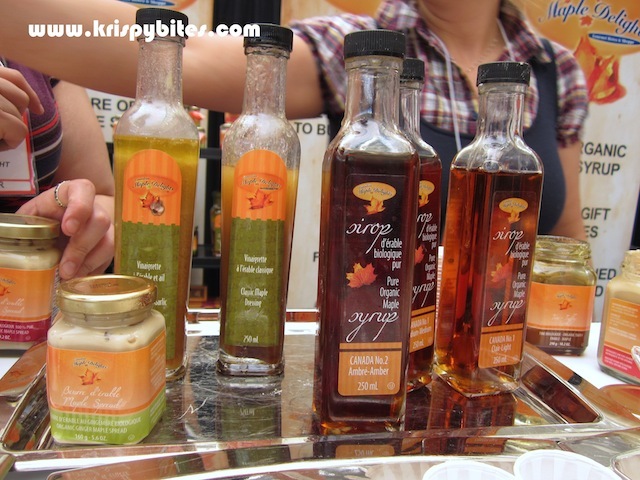 I couldn’t imagine dipping bread into those oils – the end result would not be tasty. Camelina oil was tasty. And it’s Canadian. And it claims to be natural, sustainable and traceable, so you know exactly where it came from. Perfect for the hyper-environmentally/socially/humanistically conscious Vancouverite. The last food product I am going to mention is from Epicure. 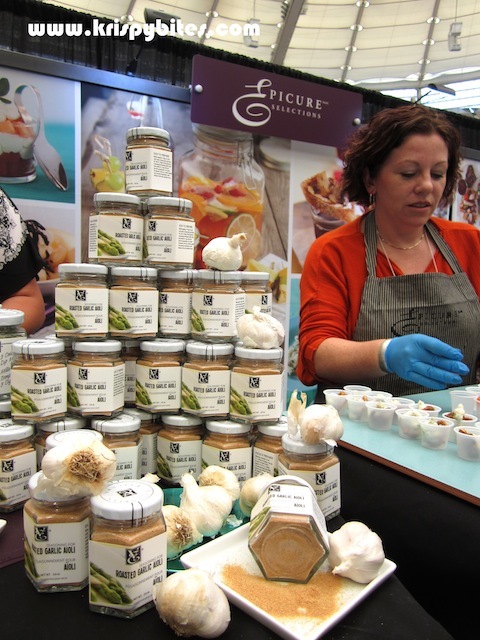 Epicure is a Canadian company run by women in a slightly Tupperware party-esque fashion. It’s a little pricey, but when I tried their Roasted Garlic Aioli, I understood why. I’ve had aioli in many permutations many times since it first appeared on the food scene in Vancouver about five years or so ago. I’ve never had one that was as perfectly rich and scented with roasted garlic as the one from Epicure. This is the aioli that made me want to make my own aioli, not because it was bad, but because I’ve finally tasted the aioli that inspired me and made me think learning to make this is a worthwhile challenge. 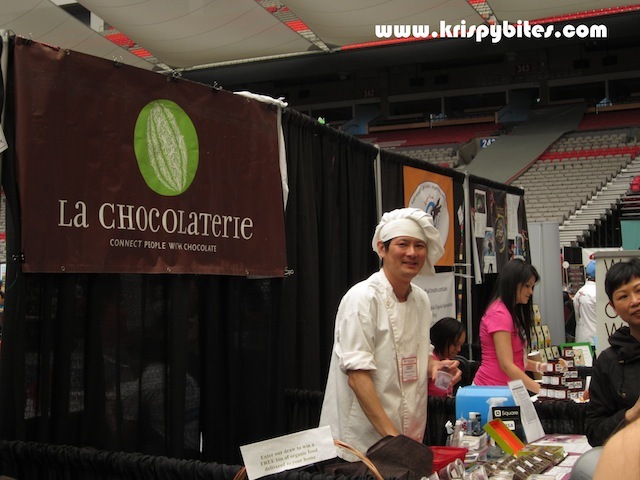 There were also exhibitions on food prep products, from basic, if high-end, kitchenware to informercial items to those marketed at the aspiring molecular gastronomist, exhibitions on food clubs and, of course, exhibitions from restaurants around Vancouver with small samplers on sale for tickets. 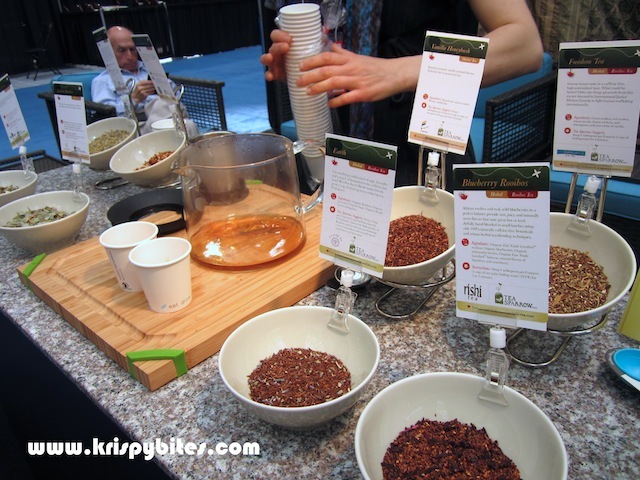 There were also two non-traditional food/drink exhibits of interest. 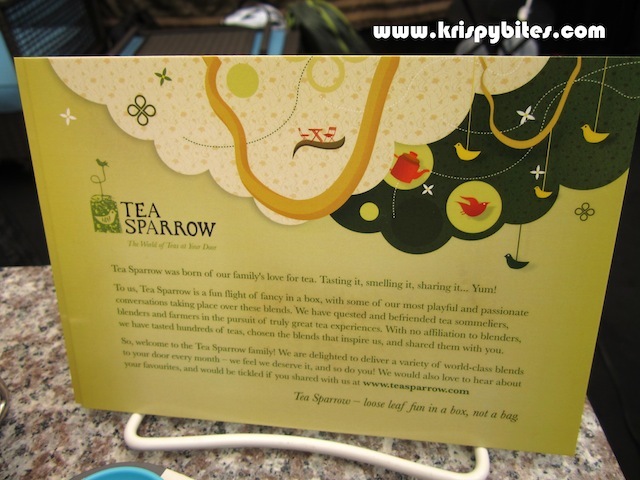 Tea Sparrow is a tea tasting club. 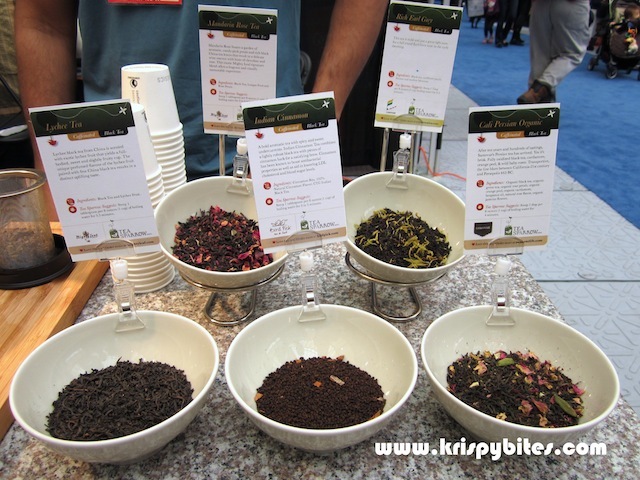 For the price of $20 a month, they will ship 4 different teas to you a month (free shipping) to try. 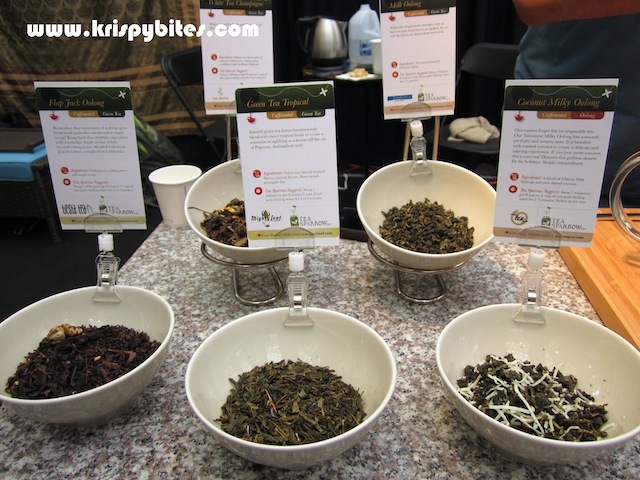 If you like the tea, the manufacturer’s information is included on the tea so that you can contact them or purchase from them directly. I am not a tea person, otherwise I would sign up for this. I can’t go through 35 cups of tea a month. 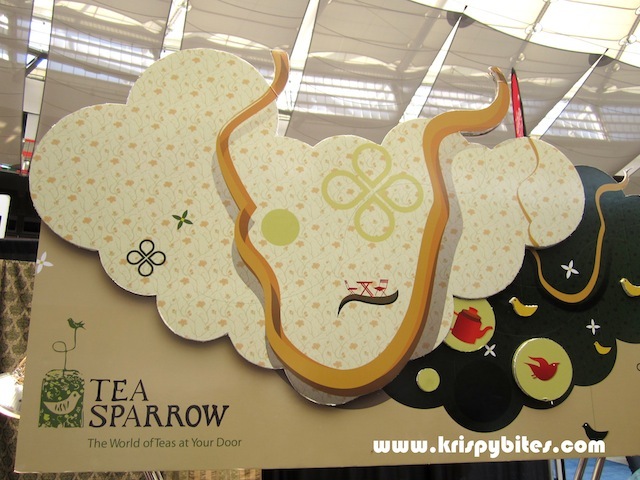 I am, however, waiting for the coffee equivalent of Tea Sparrow. The Foodie Card is, of course, an orphan child of Groupon and its ilk. 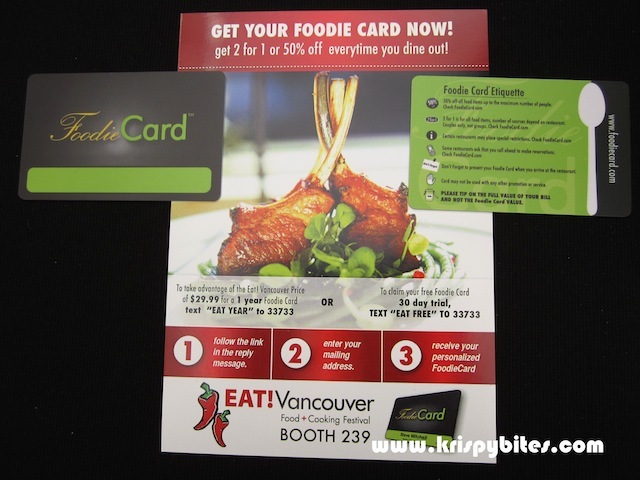 For the price of $29.99 a year, you get a Foodie Card, which gets you 50% off or a 2 for 1 special at select restaurants throughout Vancouver. Unfortunately, the number of participating restaurants is still quite small; however, if you dine out a fair bit, the Foodie Card would be easily worth the initial investment. For those who aren’t merely there to eat, but to learn, EAT! 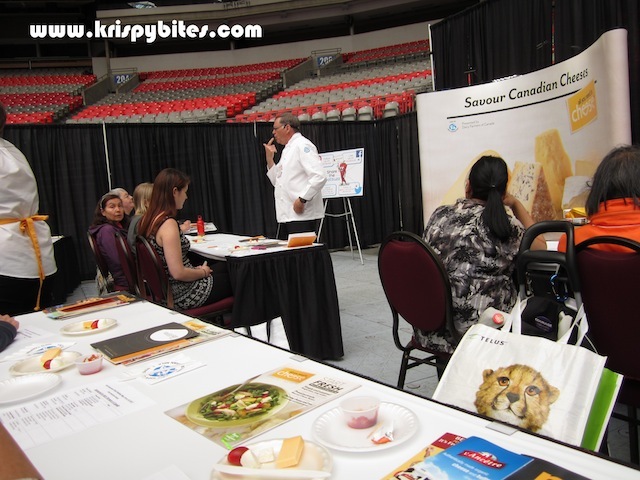 Vancouver also presents half-hour seminars on Canadian cheeses throughout the day. 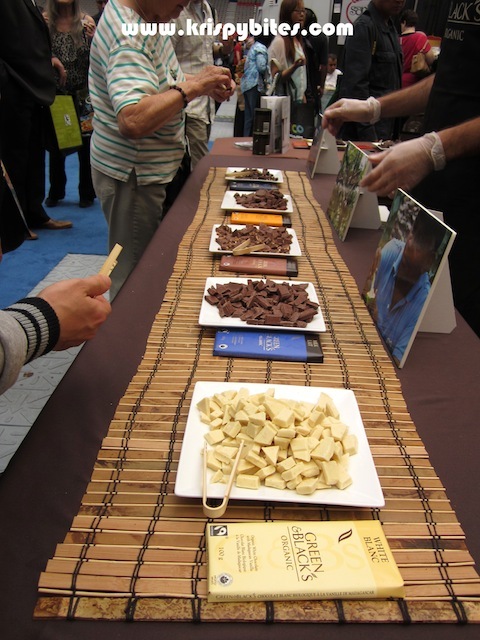 The cheese seminars are presented by a host from The Dairy Farmers of Canada who will walk you through the tasting of seven different cheeses. To my delight, the seminar was free, and in addition to the seven cheese samples, we also got a smorgasbord of verbal advice about serving cheese at home – all the way from sanitation and storage conditions to hosting parties with cheese, pairings and labelling the cheese offerings so your guests know what they’re eating! 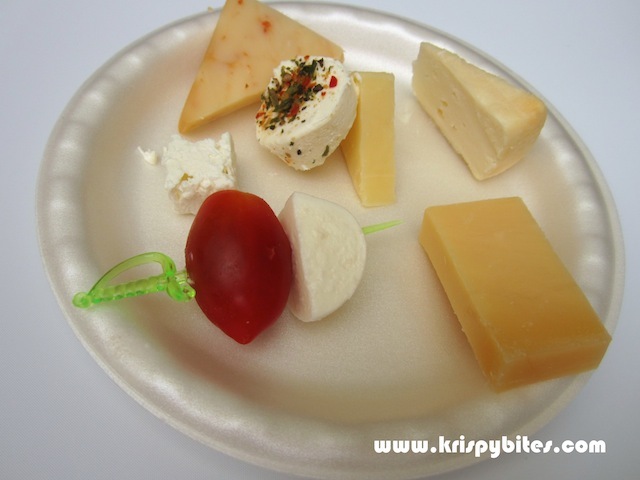 – as well as lots of paper materials on Canadian cheeses and recipes. 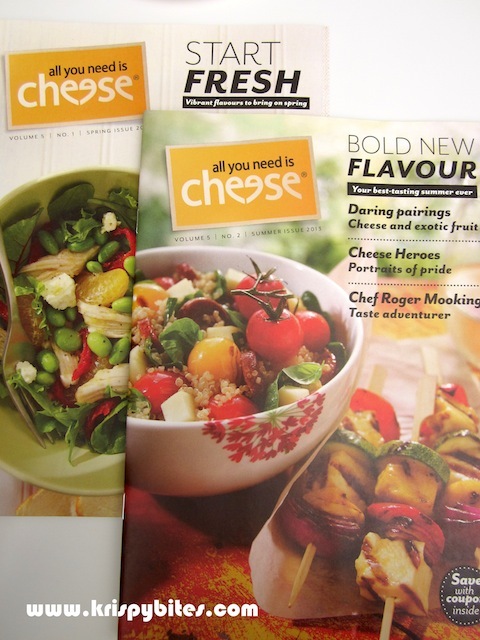 One magazine The Dairy Farmers of Canada were pushing was the All You Need is Cheese magazine, which is free and can be picked up at your neighborhood specialty cheese retailer. Alternatively, you can subscribe online and they will mail it to you. The seven cheeses we got to try were: the Tre Stelle Boccocini (on a skewer with a grape tomato), Tre Stelle Feta (the white crumbly square), Canadian Gouda from Fromagerie Bergeron (the rectangular piece with two shades of golden cheesiness), Harvest Moon Camembert from Poplar Grove (the wedge), Mild Cheddar from L’Ancetre (the pale triangle), Bouchée Saveur Italienne, a cream cheese, from Damafro Inc (the round with sprinkled herbs), and Smoked Cheddar with Salmon from Village Cheese (the triangle studded with orange specks). I loved the feta and the boccocini paired with the grape tomato, but these are tried and true classics for me. (The boccocini could’ve used some olive oil…) I also liked the Bouchée Saveur Italienne (cream cheese), and learned that I preferred the rind part of the gouda (more orangey side) to the centre, simply because it had a more solid texture that, I felt, contrasted better with the flavor than the softer centre. 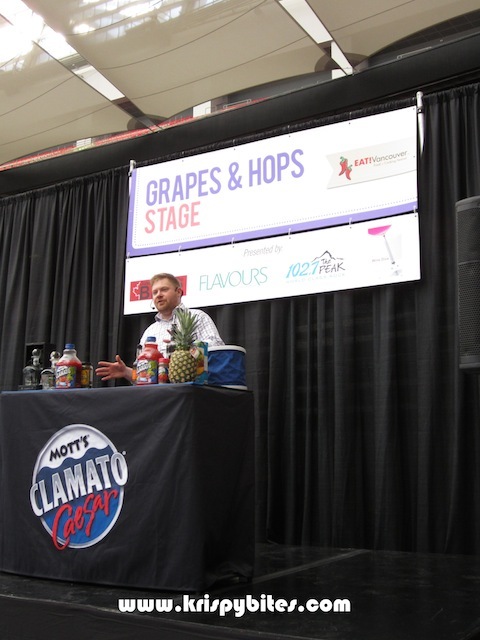 In addition to the cheese seminar, I also attended the Making the Perfect Caesar and Summer Sippers seminars over at the Grapes and Hops Stage inside the Wine, Beer & Spirits Tasting Pavilion. Seminars inside the Wine, Beer & Spirits Tasting Pavilion cost 4 tickets ($2), but like the cheese seminar, attendance includes a small sampler of whatever the seminar is on. The Caesars seminar was presented by Clint Pattemore, who is a very amusing presenter. He regaled us with jokes and little tidbits of information about the origin of the caesar – Calgary, Alberta – and walked us through the making of the classic caesar. 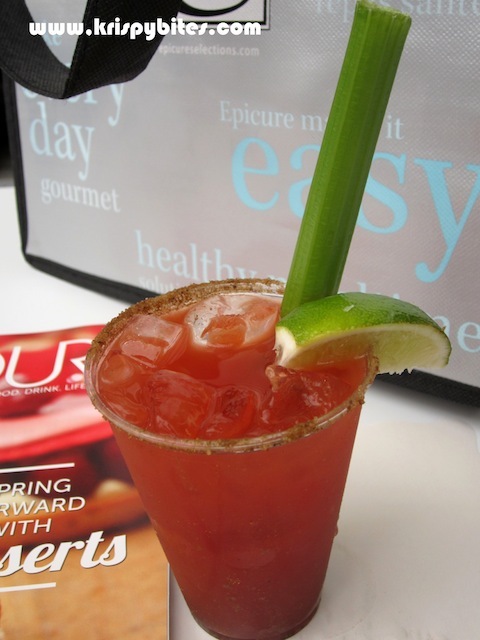 He next showed us how to make a lighter Caesar, a more summery patio one, with a pineapple and basil base. We got samplers of the two different kinds of caesars. 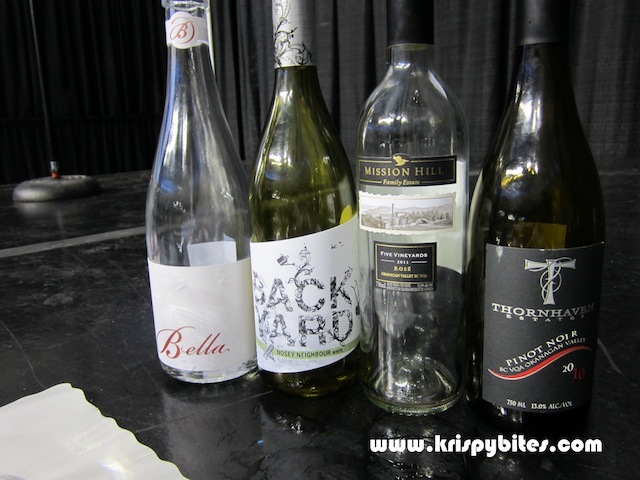 The Summer Sippers seminar was presented by Wine Diva Daenna Van Mulligen. 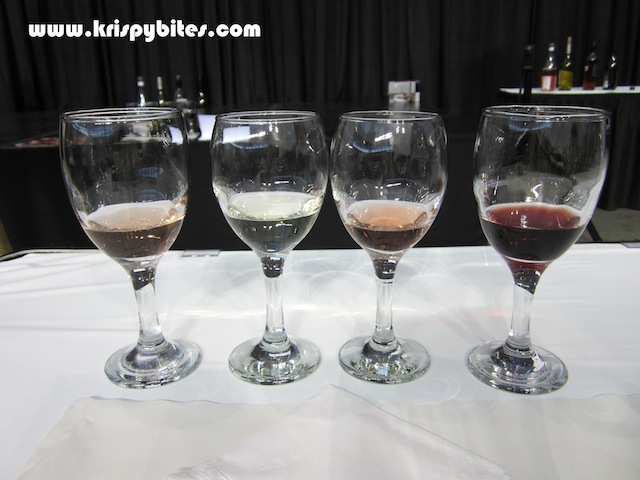 In this seminar, we got to try four different wines: two rosé, one white and one red. The first wine, a rosé from Bella, smelled and tasted of strawberries, with a slight tartness and bubbles. The flavor was fresh and distinct, but not too sharp. The second wine, a white one from Back Yard, was reminiscent of gewürztraminer wines. Of the four wines we tried, this was the sweetest and driest. The third wine, another rosé from Mission Hill this time, was my favorite of the four. Daenna pointed out the flavor of rhubarb, but I am not familiar enough with rhubarb to be able to recognize it from the bouquet. This rosé had a fresh, but smoother smell compared to Bella. It also smelled less sweet and tasted fresher. The flavors were more subtle and less in-your-face bold. The last wine, a pinot noir from Thornhaven, had a light cherry and cedar smell. Of the four wines, this was my least favorite, as it had the slight bitterness and astringency I usually associate with white wines. For those interested in culinary entertainment, there were a number of celebrity chefs from the Food Network giving cooking demonstrations at EAT! 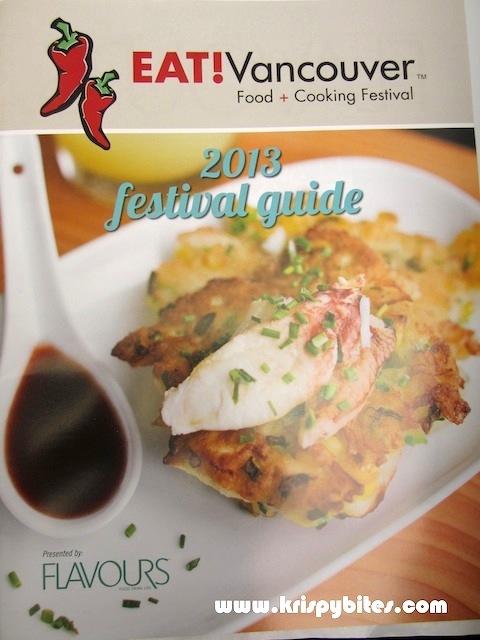 Vancouver, as well as a celebrity chef cook down competition. For the tactile learners amongst us, there were also culinary classes ($28) offered by the Pacific Institute of Culinary Arts. I watched Cake Building 101, and was in equal parts entertained (by the students’ crumbling cakes) and fascinated (by the techniques the teaching chef used to salvage everyone’s cakes). While I only watched part of one class, they do seem to be geared towards the beginner, if not complete novice, cook/baker. 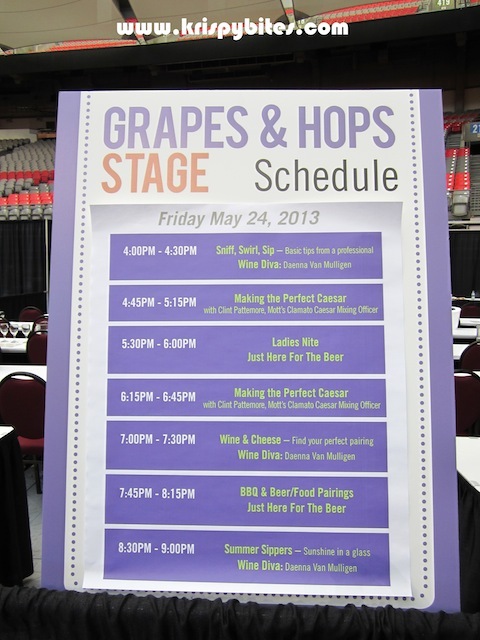 And last, but never least, was my brief foray into the Wine, Beer & Tasting Pavilion to try the alcohol exhibits. Everything in this pavilion requires tickets (50 cents each), starting with the “loan security” of two tickets for a beer or wine glass at the entrance. I first tried a wine (Amphorae) from a fancy looking exhibit that was unimpressive. Next, I decided to try the peach beer from Pyramid after the vendor claimed it was their most popular item and that they were nearly out. Worst. Decision. Ever. In all the beers I have tried and drunk in my time, I have never come as close to throwing out beer as I did in this case. I don’t even want to think about this beer. This was a sickly sweet beer that fizzles in your mouth, and after you swallow, leaves you with a strong, bitter aftertaste. I like Heineken and I like IPAs (including Alexander Keith’s, even though it’s not bitter at all), but this was a disgusting beer. 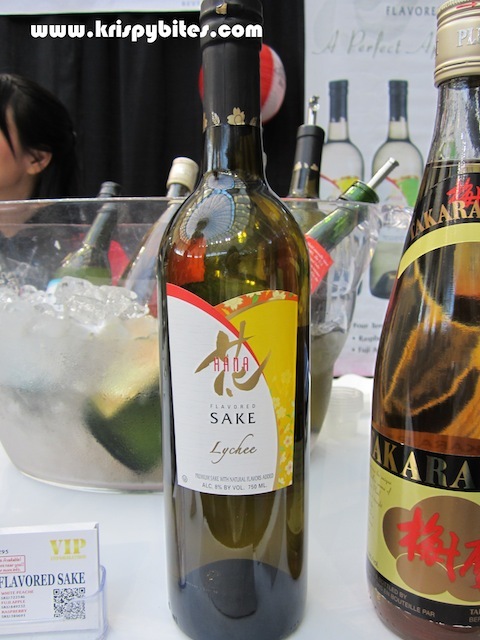 The next thing I tried was the lychee sake, recently made available in BC Liquor Store. It smelled and tasted of lychee, and with an 8% alcohol content, could be chilled and served as a cocktail on its own. It was a sweet sake, but not overwhelmingly so. After this, I decided to try the hard liquor – gin. As I approached the stand, a lady walked away commenting on how prevalent the taste of olives was in the gin. First off, I confess that I do not know much about gin. I am not fond of gin and tonic, but I am fond of an amazing gin martini a Calgary friend once made for me. Victoria gin was a little strong for me, even after the lady diluted it down with tonic water, but the clean aftertaste of olives was definitely present. The Oaken Gin, which is Victoria Gin aged for a few months in oak barrels, tasted and went down a lot smoother. 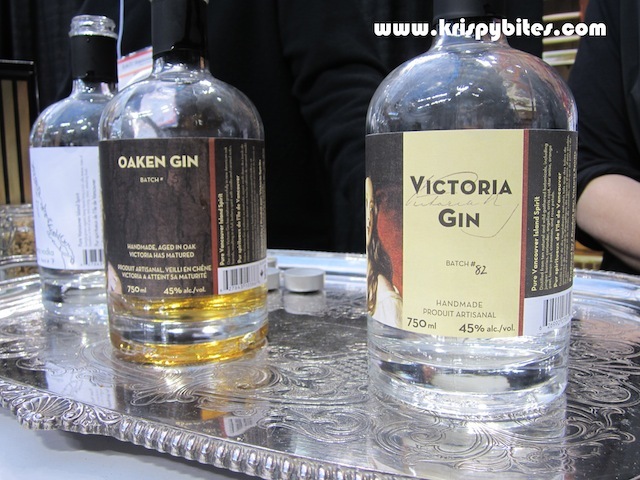 If I were to make a gin martini, I would use the Victoria gin, but as a drink on its own to enjoy, I would choose the Oaken Gin. 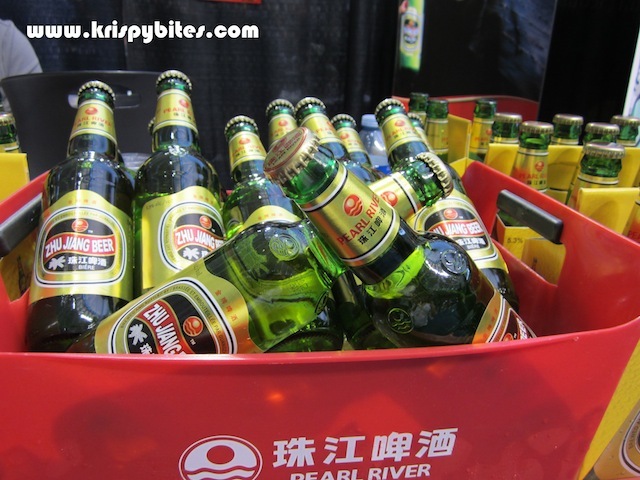 The last thing I tried was a beer from China – Zhu Jiang beer – which, true to most Chinese beers I have tried, was a pleasantly sparkling drink that went down easy. No bite, but not bland, either. I would drink this beer. Pyramid Brewery, no. Zhu Jiang, yes.